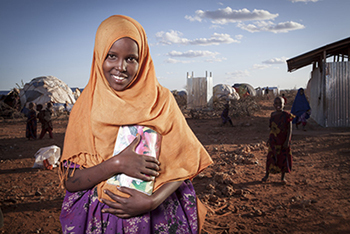 The Boston Consulting Group (BCG) is one of Save the Children's key partners. Our global relationship, in place for over 20 years, has seen the group's consultants dedicate their time and expertise to collaborate with us on a number of international and domestic projects. BCG is a global management-consulting firm that provides strategic advice to organisations across all industries and sectors. BCG helps these organisations improve their performance by solving problems and finding new and better ways of doing things. Our partnership gives the BCG team the opportunity to apply skills normally associated with business consultancy to a different goal — improving our impact for children. BCG's work with Save the Children takes on many shapes and forms. For example, after the 2010 earthquake in Haiti, BCG consultants worked with us to improve our supply chain to ensure the right supplies were getting to the children who needed them most, as quickly as possible. BCG also helped on longer-term related issues, including improving the way we generate funding for people that were still trying to re-build their lives. Four years later, 150,000 people remained displaced, still living in the temporary plastic and plywood structures erected after the disaster. Thus, BCG collaborated with us in 2014 to develop a fundraising strategy to help raise over $550M in emergency funds. Additionally they helped us develop approaches and tools to ensure that our emergency responses ran more efficiently overtime, helping save money and time. Our ongoing partnership means BCG can be flexible in meeting our changing needs as new crisis emerge. At the start of 2014, Ebola broke out in West Africa, threatening millions of lives. As the crisis worsened, BCG worked with Save the Children to improve the process for getting staff safely and quickly to areas most affected by Ebola, allowing us to respond to the children and families most impacted by the outbreak. BCG is also supporting our ongoing response to the refugee crisis. Partnering with BCG, we evaluated how to best play our part in meeting the needs of the more than 20 million children on the move around the world. BCG continues to supports much of our internal work, applying their strategic acumen to our most pressing organizational challenges. “BCG's global partnership with Save the Children began as part of our continuous efforts to make a difference and improve society globally and in our local communities. Working alongside Save the Children on their highest priorities, including strategy, country operations, fundraising, and advocacy, represents one of the most important things that we do as a consulting firm—strengthening organizations to better address the many challenges facing the world," said Rich Lesser, CEO, the Boston Consulting Group.